Composed by Natalie Sleeth. Arranged by Martha Lynn Thompson. Choral. Choral Music for Children / Ring & Sing Series. Christmas, Children, Contemporary. Octavo. Published by Hope Publishing - Digital (H1.CF1906DP). Scriptural Reference: Matthew 2:1 - Matthew 2:2 - Matthew 2:3 - Matthew 2:4 - Matthew 2:5 - Matthew 2:6 - Matthew 2:7 - Matthew 2:8 - Matthew 2:9 - Matthew 2:10 - Matthew 2:11 - Matthew 2:12 - John 3:16 - Luke 2:14. 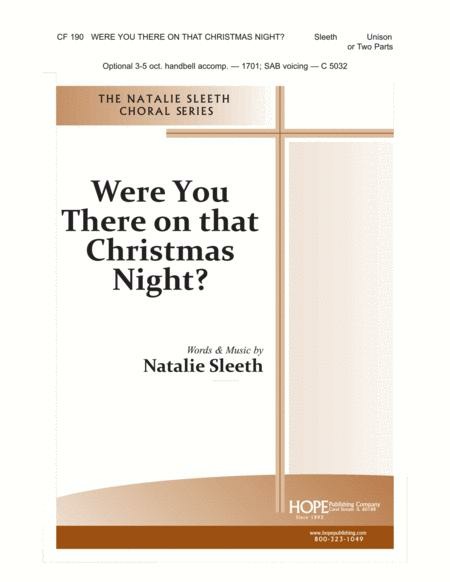 The master melody writer, Natalie Sleeth, originally composed this captivating Christmas selection in a unison/two-part setting. That anthem has gone on to be one of the all-time best-selling pieces in the Hope choral catalog. It is now available in an SAB version with piano or 3-5 octave handbell accompaniment. Preview: Were You There on That Christmas Night? I have loved this song over the years but have struggled to find this exact copy. I was so excited to see it here and ordered it right away. It's a PERFECT duet song.